The political forces that are behind the latest outbreak of violence in eastern Ukraine are seeking to block the path towards improved US-Russian relations the Russian envoy to the UN told RT. “Those, who are provoking those manifestations of violence in the Eastern Ukraine,” are actually aiming at making “sure that there are additional obstacles for the improvement of relations between the US and Russia” because they do not want the relations between the two countries to improve, Russia’s Ambassador to the UN Vitaly Churkin told RT’s Aleksey Yaroshevsky in an interview. Churkin said the “recent spike of military activity [in the Eastern Ukraine] was initiated by the Ukrainian Armed Forces and the [so-called] volunteer battalions” that are fighting in the east of the country. He particularly emphasized that the reports of the OSCE monitoring mission in Ukraine prove that the bulk of the blame lies on Kiev. “If you read the reports of the OSCE monitoring mission in Ukraine, … it is obvious that it is the fault of the Ukrainian [government],” Churkin said, referring to the latest escalation of violence in Ukraine. He added that the OSCE mission “could be clearer in presenting the facts, which they have” at some points. He then said the western media's coverage of the Ukrainian conflict distorted the facts to a great extent. “One has the impression that only Avdeevka is being shelled,” he told RT, referring to a town controlled by Ukrainian government forces, which is located close to the contact line in the Eastern Ukraine. Churkin pointed that the international media turned a blind eye to the fact that the shelling of Avdeevka began only after the Ukrainian forces moved its heavy weapons into the settlement. 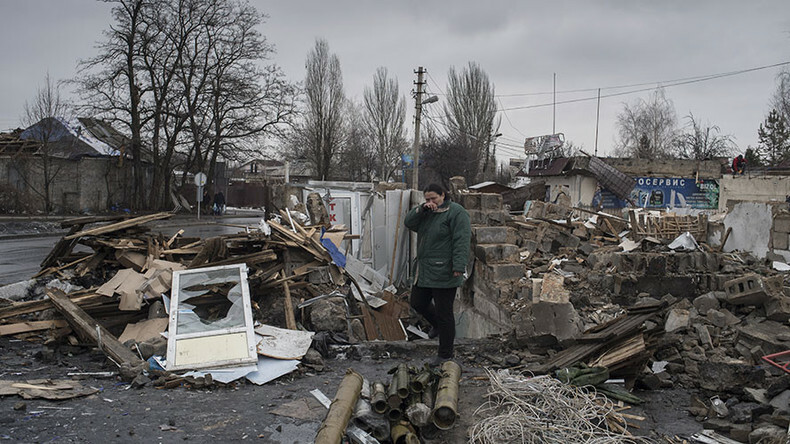 “Their weapons are not supposed to be there but now they are there and they are shelling Donetsk,” he said. Churkin also called out “the lack of objectivity” in the coverage of the Ukrainian conflict presented by many international media outlets as one of the major problems impeding peace process in the country. Ukraine, which currently presides over the UN Security Council (UNSC), convened a meeting on February 2, following the escalation but failed to “reap much benefit” from “making provocative statements about Russia and the situation in Donetsk.” Most UNSC members, with the exception of the UK and the US, said the Minsk agreements should be implemented and stressed the need for a political settlement, Churkin told RT. He said many international actors still do not want to explore the nature of the Ukrainian conflict but rather see it as a geopolitical rivalry between Russia and Ukraine and act on the basis of their sympathies towards one of the two countries. In December 2016, Ukraine introduced a resolution on human rights in Crimea to the UN General Assembly. “Those, who voted on it, did not vote on human rights in Crimea, many of them did not even read this resolution,” which became “another test on sympathies towards Ukraine or Russia under the current circumstances,” according to Churkin. “Now, the support of Ukraine clearly diminished in the UN and it is a very encouraging trend in terms of pressure that needs be put on Kiev to make them do the things that need to be done in order to implement the Minsk agreements,” he said. Three civilians died and 15 were wounded as a result of the shelling. The attacks also damaged at least 60 residential buildings as well as civilian infrastructure. Just days after the attack, US President, Donald Trump held a phone conversation with his Ukrainian counterpart, Petro Poroshenko, and promised to work with all parties involved to settle the Ukrainian conflict and to restore peace in the region.